Parents get smarter the older we get, and looking back some of that advice was too late. Mom recently emailed me to let me know there are stories here about my childhood Growin’ Up in Maine that she never knew, and she was glad they were kept secret back then. Now Mom can say I told you so, again. My hip joints aren’t what they used to be. As shown here, some of the winter sports we invented in the late 1950’s in Derby, Maine, may be part of the reason. 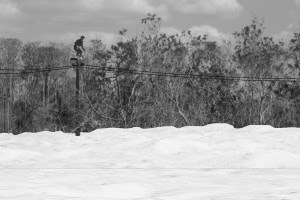 Ayuh, a good friend and close neighbor and I went Down Back by the railroad tracks one winter day, and decided to try a circus act atop a telegraph pole. We shimmied up and managed to stand upright on the very top surface before leaping to the ground into 6 feet of snow. The landing wasn’t bad, but you needed assistance digging out because you were stuck tight. As I recall, we took turns 3-4 times before the excitement wore off. Today my brain is around 38, most of me is 58, but those hips are feeling like 78.